At the Recently Concluded Republican National Committee there were protests. The Anti-War Activists and the Anarchists had their day. Somali Immigrants held a protest themselves. Why wasn't this covered? The Somali Community is Outraged over the Current US Policy towards Somalia. The Bush Administration has supported the Ethiopian Intervention in support of the weak UN Mandated Transitional Government. Since the Intervention in December 2006 there has been no discernable increase in either the stability or security within the country. In Recent Weeks there has been an increase in the number of incidents involving Piracy. It is believed that the Islamists in the Country are regrouping as well. 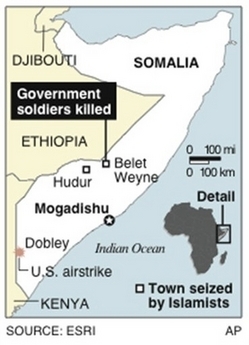 This is a map of Airstrikes by the US Air Force Earlier this year in Somalia. Currently the US Policy in the Horn is very Confused. The State Department was in a State of Confusion as to how it should react to the violent aftermath of the Kenyan Elections. Those Diplomats in Nairobi were part of a group that were able to negotiate a Government of National Unity while in Washington there was Confusion. The Administration has received Justfied Criticism regarding its Dealings with Prime Minister Zenawi of Ethiopia. The Country is suffering from a Drought and an Insurgency in the Ogaden Region. Legislation that would place greater scrutiny on Ethiopia is stalled in the US Congress. ( The Confused Eagle supports HR 2003.) This Bill deals with the Human Rights Climate within Ethiopia. The situation in Somalia is a source of tension with Eritrea. When it comes to Somalia there is no easy fix to it. Currently the attempts to prop up the Current Transitional Government are tedious. The levels of Violence remains the same almost 2 years after the Ethiopians Arrived. The Only part of Somalia that appears to be successful is Somaliland. Earlier this year there was an attempt to Introduce in the Congress Legislation that would have the US recgonize the Independence of Somaliland. There has been no movement on this bill. The Current State Department position is to wait until the AU recgonizes the Independence of the Region. Currently the Joint Task Force-Horn of Africa (CJTF-HOA), Homeland Security and the CIA have high level contacts with the Breakaway region. Should the US have even more offical contacts? There are rumors that Al-Qaida may use Somalia to regroup after failing in Iraq. And the Media would not give these people the voice that they gave to the Anti-War Protestors? The Somali Blogosphere and the Independent Media in Minnesota were the only places where this Protest was covered.